This is a picture book, with very few words but lots going on in the pictures. For example, the first spread shows a red bus which has just left a bus stop. It's a lovely day, the sky is clear and blue. 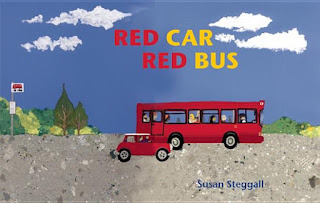 Then we notice that behind the bus there is a red car. Some small clouds appear in the sky. We notice a woman and her little boy running towards the next bus stop, and behind them, a yellow car. Whoops! the little boy drops his teddy bear but mum doesn't notice, she's concentrating on trying to catch the bus. Will she make it? And what about the teddy bear? It sounds so simple, but there's a great deal going on, with more to notice and pick up on every time you look at the book. The illustrations are beautifully crafted collages, made of lots of torn bits of paper in bright primary colours. This is a lovely book to read with a small person, who will delight in all the familiar scenes and objects revealed as the pages turn, and in creating new stories from the wealth of detail provided by the illustrations. That book sounds like one of those 'oh, I wish I'd thought of that' ideas that is brilliantly simple, and obvious once somebody else has done it. Clever her! Winter blades are designed to resist freezing. Speaking of winter and freezing conditions. I should grab this book for my little one. Our buses are highly unusual in that they were airport buses, built to tow luggage trailers, and so we can carry extensive tat on tour up to and including marquee tents which we erect on arrival at the venues, with any kitchen, staging, PA systems etc. that are needed. Visit us now at Red Bus Hire office. Great people to deal with, I hardly need to check prices as they always do me the best deal possible, we've had 2 cars and 5 commercials now and I've been happy with the deal each and every time..